Momentum-100A ESC belongs to Exceed RC?s "Momentum" series products line, it is the most significant top-class product for aircraft and helicopter. 2.1 Output: Continuous 100A, burst 150A up to 10 seconds. 2.3 BEC: Switching mode DC-DC regulator. 3A@5.25V or 3A@6V switchable by user progromming. 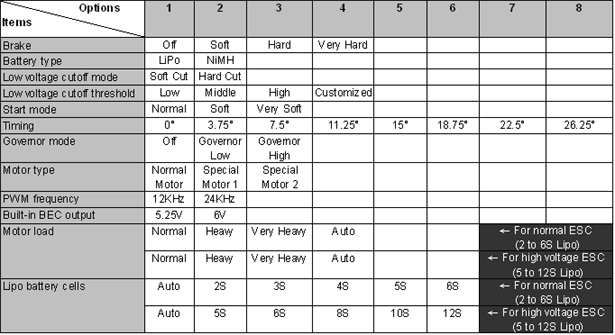 2.5 Max Speed: 210,000rpm for 2 Poles BLM, 70,000rpm for 6 poles BLM, 35,000rpm for 12 poles BLM. 3.1 High performance microprocessor brings out the best compatibility with all kinds of motors and the highest driving efficiency. 3.2 Wide-open heat-sink design to get the best heat dissipation effect. 3.3 With 3 types of start mode: Normal / Soft / Very-Soft, compatible with aircraft and helicopter. 3.4 Smooth, linear, quick and precise throttle response. 3.5 The output voltage of the built-in BEC is switchable by user programming (5.25V or 6.0V). 3.7 Perfect governor mode for helicopter. 3.8 The firmware of the ESC can be updated through the USB adapter on the Professional LCD Program Box. 3.9 User programmable. Several kinds of program methods are supported: transmitter, digital LED program card, advanced professional LCD program box, PC software. Very easy to program the ESC at home or at the flying field.